The decay of the traditional Western media into irrelevance continues, as it sinks to the level of the old Soviet Pravda. 1. (AP) JERUSALEM — Prime Minister Benjamin Netanyahu’s government has made two overtures to West Bank settlers in the run-up to his party’s leadership race on Tuesday: It’s offering financial incentives to encourage people to move to settlements and opening the door to legalizing rogue settler outposts. 2. The gestures appear to be aimed at appeasing hardline elements in the ruling Likud Party who are sympathetic to settlers. While Netanyahu is expected to win the leadership race, a relatively strong showing by his ultranationalist rival would suggest many Likud voters consider the prime minister too soft on peacemaking with the Palestinians. 4. Years ago, the Israeli government halted generous financial enticements designed to encourage Israelis to settle in the West Bank, the occupied territory the Palestinians see as the core of their future state. 7. …the panel’s makeup aroused suspicions it would legalize at least some of the more than 100 outposts built without government authorization, including dozens Sasson says were erected on privately held Palestinian land. This is presented as a news story, not an editorial. Let’s look at how it’s constructed. In the very first sentence, the idea is introduced that these actions were taken in order to improve PM Netanyahu’s chances in the Likud primary. This may be true to some extent — although his opponent, Moshe Feiglin, is in no way a real threat (initial results show Netanyahu with 63% of the vote vs. Feiglin’s 36) — but surely, unsourced speculation about Netanyahu’s motives does not belong in the lead sentence of a news story. The reporter does not let up in the second paragraph, where he refers to “hardline elements” who are “sympathetic to settlers.” I would hazard a guess that almost all Likud party members are to some extent sympathetic to Jews living east of the Green Line, considering that they face pressure from the Arabs, the US, the EU and the (vanishing but foreign-supported) Israeli Left to leave their homes and become refugees like the former residents of Gush Katif. In paragraph 3, we get the usual line that “settlement construction” — meaning construction within existing settlements — may “derail” peace efforts. Why is that? It doesn’t change anything, particularly since most of the construction is in the larger settlements or eastern Jerusalem neighborhoods that would be expected to become part of Israel in any reasonable peace agreement. It is a problem only because the Palestinians insist that it will be. One would think that the introduction of the Hamas into the Palestinian Authority and the likelihood that it will win future elections (or coups) would be a much bigger problem! But the writer doesn’t mention that. Then in paragraph 4, he trots out the “occupied territory the Palestinians see as the core of their future state.” The implication is that Israelis don’t have a right to live here, and Palestinian demands for Jew-free land are acceptable. I’ve discussed the falsehood of this view here. Only in paragraphs 5-6 do we get to something partially resembling factual reporting. We are led to understand that there is a controversy concerning a 2005 land use report authored by Talia Sasson. The writer tells us that she became associated with a “dovish” party and so her objectivity when she determined that many settlements were built on “private Palestinian land” may have been questionable. But Talia Sasson is a board member of the New Israel Fund, a member of the Public Council of Yesh Din, a foreign-funded left-wing NGO which carries out ‘lawfare’ against Israel in the name of ‘human rights’, and a Knesset candidate of the fringe New Movement-Meretz party (which has 3 seats out of 120 in the Knesset). She is a professional opponent of the Jewish presence in the territories. Her objectivity is more than questionable, it is non-existent. Finally, paragraph 7 uses the loaded phrase “arouses suspicion” and quotes Sasson as an authority. After suspending benefits unique to the settlements, the government is now encouraging settlers to move to the West Bank under a different program, said Hagit Ofran of the anti-settlement group Peace Now. “They put in 70 settlements, in effect encouraging them to live there,” Ofran said. I know that there is a place for what Hunter Thompson called “Gonzo journalism,” but it isn’t a wire service news report, where the ancient Five Ws are still appropriate. 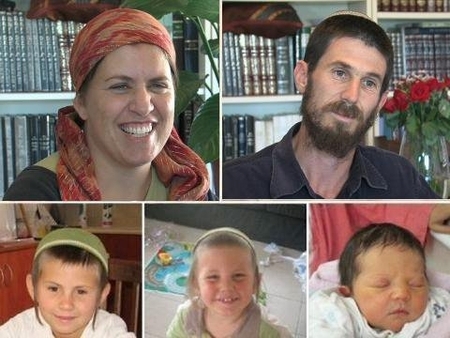 The murdered Fogel family: Ruth, Udi, Yoav (11), Elad (4), Hadas (4 mo.). The absolute vileness of the “Palestinian movement” is hard for those of us who grew up in civilized societies like the US and Israel to comprehend. As a result, many of us may be prepared to listen when they say that it is about human rights or justice. But every once in awhile we get a window into what’s really behind it. Even Israeli police and security personnel, who have seen some terrible things, were shocked last year by the sadistic murder of five members of the Fogel family including a 4-month-old baby whose throat was cut, committed by two Palestinian Arab teenagers, Amjad and Hakim Awad, cousins from the village of Awarta. Captured after an intensive manhunt, the Awads were both convicted and given multiple life sentences. There was even consideration of applying the death penalty, something not done in Israel since Eichmann was hanged in 1962. Unfortunately, the court decided against it. But they are past pretending even that much.The official reaction is that the butchers are heroes! Mother of Hakim Awad: “I thank you for connecting me with my son, because I and all of the family are prevented for security reasons [from visiting him]. In your eyes, we are all self-sacrificing fighters. This is nothing new. According to the Palestinian ethos, murdering Jewish civilians, including (especially) children, is not only legitimate, but praiseworthy. Actually, no. Pro-Arab propaganda often takes the form of inverting reality, accusing Israel of behaving like Nazis, or (more to the point) Arab terrorists. The IDF’s operation in Gaza in 2008-9, a response to the thousands of rockets that had been bombarding Israeli towns since 2002, resulted in a higher ratio of combatant to noncombatant casualties (about 3 to 1) than any instance of urban warfare in recent times (where the ratio is more like 9 to 1). This is despite the fact that Hamas deliberately operated from civilian areas in order to use the population as a shield. The Ma’alot massacre, in which 25 Israelis were killed including 22 children, the Bus of Blood (35 dead, 13 children), the attack on the nursery at Kibbutz Misgav Am (3 dead, 2 children), the Dolphinarium bombing (21 teens dead), the Sbarro Pizza bombing (15 dead, 5 children), the shooting at the Mercaz HaRav Yeshiva (8 dead, 7 teens), the vicious butchering of the Fogel family (5 dead, 3 children), the antitank rocket attack on a yellow school bus (1 child) — these are just a few of a long, long list. One of the scandals of the the conflict is that the media have helped the Arabs get away with portraying it as a dignified struggle for self-determination, when it is better described as one to eliminate the Jewish presence from the region, carried out primarily by terrorism against civilians — an attempt to make living in Israel so painful that Jews will simply give up — and only secondarily by conventional war and diplomacy. Don’t expect to see the details of the Palestinian admiration for murderers in the NY Times, for example. [Marwan] Barghouti, who is likely to become the next Palestinian President, was convicted by the Israeli justice system of five counts of murder – four Israelis and a Greek monk – during the second intifada. There is no question he supported and encouraged violence. Actually, as the head of the Fatah Tanzim during the second intifada, he was almost certainly responsible for many other murders. But the prosecution was unable to provide sufficient evidence to convict him of more than five, for which he received five life sentences. In a normal world it would be impossible to imagine that one country would release a convicted mass murderer so that he could become the president of a state to be established next door. In Russia (or Texas) he would be executed. Here in California, he might be sentenced to death but then remain in prison for life (while running up astronomical legal costs). But he would not be released to become, for example, Governor of Nevada. Barghouti’s involvement in past terror attacks does not change the fact that in light of the political developments on the Palestinian side – the possible reconciliation between Hamas and Fatah and especially the lack of contenders against President Mahmoud Abbas – Barghouti remains the only Fatah member who could inherit Abbas’ place when the time comes. In other words, since he is the one murderer that two murderous terrorist organizations find acceptable, then by all means Israel should facilitate unifying them by letting him go free. Incredible logic! 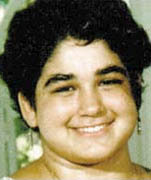 March 24, 2002 – Esther Kleiman, 23, of Neve Tzuf, was killed in a shooting attack northwest of Ramallah, while traveling to work in a reinforced Egged bus. Esther completed high school at Ulpanat Zvia and then volunteered for National Service for two years in the Neveh Sha’anan School for disturbed children in Jaffa, where she worked with both Arab and Jewish children. After completing her service, she studied special education at the Talpiot teacher’s college in Jaffa. Esther was quiet and shy, but she loved working with children, her father said, and preferred relating to the youngsters on a one-to-one basis, rather than in a classroom. Neve Tzuf residents described Esther as a very kind and pleasant person who always had a smile on her face. She worked as a volunteer with disabled and disadvantaged children in addition to her regular job. Kleiman’s family is suing the Palestinian Authority for several million dollars, because the Fatah al-Aqsa Martyrs Brigades killed her. Barghouti is supposed to testify on the connection between Fatah, the PA, and the al-Aqsa Brigades. Of course he refused to testify on the grounds that he does not recognize the authority of the court (to be precise, he does not recognize the Jewish state). The court hearing provided Bargouti with a rare opportunity to communicate with the Palestinian – and the Israeli public. One of the most important messages he conveyed to the many journalists surrounding him was that an Israeli withdrawal to the 1967 lines and the establishment of a Palestinian state will bring an end to the Israeli-Palestinian conflict. In the past, Barghouti spearheaded the Fatah faction that called for terrorist attacks against Israeli targets in the West Bank, and from January 2002 he even supported attacks within the Green Line. Like many Palestinians, Barghouti drew inspiration from Hezbollah, which forced Israel to retreat from southern Lebanon in May 2000, and thought that adopting the Shiite group’s tactics will cause Israel to withdraw from the Palestinian territories. However, in recent years Barghouti admitted that the Palestinians made a grave mistake by turning to terrorism. In countless interviews he said he supports “popular resistance” – that is, unarmed resistance. Is that the way ‘popular’ means ‘nonviolent’? …some of the people close to Barghouti have no doubt he intends to run for president, even if it means being elected while still behind bars. He also understands that after the Gilad Shalit prisoner swap – in which he was not included – his only chance of being released is to be elected president. Israel will have a hard time dealing with the international pressure to release an imprisoned president. It’s hard to think of an analogy. Could California mass murderer Charles Manson be elected Governor of Nevada? Of course not. But then, Nevada is not an artificial entity created simply to oppose and destroy California. Israel is still a sovereign state, which can keep its convicted murderers in prison despite the pretensions of its enemies. Releasing Barghouti because he may become ‘President of Palestine’, or even if he is elected, would be a surrender of sovereignty, and cannot be permitted. The best solution, going forward, will be the establishment of a death penalty for terrorist murderers like Barghouti. In today’s New York Times is a long article by Israeli journalist Ronen Bergman entitled “Will Israel Attack Iran?” It is the best-informed article I’ve read on this subject yet. It is also rational and fair — there are no villains other than the Iranian regime. It is a must-read. Bergman has interviewed Ehud Barak and several former Mossad heads. He includes a fascinating account of the various covert actions undertaken by the Mossad and perhaps other agencies like the CIA, to delay the Iranian weapons program. There are voices in Israel that say that an attack on Iran would be ineffective or the Iranian reaction so damaging as to make even an effective attack a Pyrrhic victory at best. But the position of Defense Minister Barak and PM Netanyahu seems to be that a nuclear Iran is inconsistent with the continued existence of the state. They believe that there are only a few months in which to stop it, before the program has advanced to the point that an Israeli military intervention will be impossible. They would like to see Iran stopped peacefully, perhaps a result of economic pressure. The next best option would be an American military operation. But the point of no return is farther off for the US than for Israel, due to its greater firepower and, to be honest, a lesser degree of concern. Iran is expected to hide what it is doing, to pretend to negotiate seriously, to put all the pieces of the puzzle in place except for the final assembly of a weapon. But at some point, Israel’s red line will be reached. If the US has not acted by then, Israel will be forced do so. Bergman expects that point to be reached sometime this year, before US elections. All this makes sense to me. It is almost impossible to believe that the US will launch an attack on Iran in the next few months. I can’t see any advantage for the administration, which would be accused of pulling a “wag the dog” maneuver. The resulting oil shock, as well as possible retaliation against American troops in the region, or even terrorism against the US, would be blamed on Obama at the worst possible time. But this makes an Israeli strike almost a certainty. Israel’s intention seems to be to inform Washington at the last possible moment, in order to show respect for its most important ally, but not give it enough time to stop it. The US, on the other hand, will try to find out when Israel is preparing to strike. Both President Obama and Israeli officials have pointed to the high level of military cooperation between Israel and the US as a sign of a coincidence of objectives between the countries. But there may be other reasons it is advantageous for the US to be in close contact with the Israeli military. Some analysts have suggested that a joint military exercise planned for April was canceled due to Israeli reluctance to have 9,000 US personnel in the country at this time. I’m going to go with the first option. While I think the administration would rather avoid the political risks of doing the job itself, the goals of the US and its very influential conservative Sunni Arab allies would best be served by keeping Iran from going nuclear. It would be convenient for the administration to have Iran defanged, while Israel can be blamed for any unpleasant side effects. Israel will probably find itself fighting Hizballah and Hamas, either preemptively or after they are unleashed by Iran in retaliation. There may even be attacks from other Palestinian elements who take advantage of the situation. At this point, we can assume that the US, UN, Europe, Russia, etc. will ratchet up the pressure on Israel in the name of ‘peace’, but actually to prevent any real change in the status quo. I hope Israel will be able to resist this pressure and finally crush the terrorist militias. So there it is. I don’t blame my Israeli friends and relations who look ahead with trepidation toward what may become Israel’s most damaging war. In fact I understand those who say that there is no future in fighting one war after another, ad infinitum. I understand that a lasting peace would be far better than winning a series of wars, with their unavoidable human and material cost. Of course I also understand that there is only one way to get this lasting peace, and that is by defeating the enemy soundly enough and often enough that they will understand that peace is to their advantage as well. 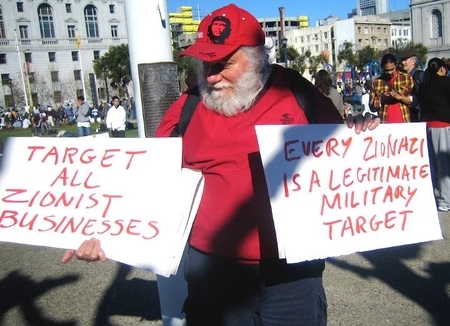 An "anti-Zionist" demonstrates in San Francisco, 2009. No Jew-hatred here! Today the impulse to hate — at least as it affects the more sophisticated Americans and Europeans — is directed at the concrete national expression of the Jewish people, the state of Israel, rather than at ‘the Jews’ … Irrational, obsessive hate is irrational, obsessive hate. Only the object is different. And the bloody results can be the same. People that hate Israel every bit as viciously as the Nazis hated Jews are at pains to distinguish their hatred from antisemitism, because although anti-Zionism is acceptable, antisemitism is not. Today, there is an absolute taboo in educated Western society against racist or ‘prejudiced’ speech. Even some words (or ones that sound like them) are absolutely forbidden. Do you recall this incident? The Wikipedia article lists several similar incidents. Of course the word ‘niggardly’ has nothing to do with the famous ‘n-word’, in etymology or meaning — it comes from A Swedish dialect word that means ‘stingy’ or ‘miserly’. I mention this to illustrate how incredibly touchy we can be about this kind of taboo. How did we get here? In America, the fact of slavery followed by institutionalized racism and the struggle to end it was especially traumatic, in different ways, for both whites and African-Americans. Similarly, the Holocaust created a sensitivity to antisemitism in Europe and America. Explicit Jew-hatred is almost never expressed by the educated classes in the US and Europe (although it is quite common in the Muslim world — a recent poll shows that only 2% of Egyptians have a favorable opinion of Jews). It is almost unthinkable that a university teacher today would delver a lecture accusing international Jewry of conspiring to take over the world, or saying that Jews have inordinate control over the US government. On the other hand, the equally false propositions that Israel is committing genocide against the Palestinian Arabs (despite the fact that their number has grown steadily since Israel was established), and that US policy is warped by a powerful ‘Israel lobby’ are heard in classrooms every day. Especially in left-wing circles, where political correctness is carefully enforced and nobody would dream of accusing Jews of putting Christian blood in their matzot, it is considered perfectly legitimate to accuse Israel of deliberately shooting Palestinian children, or of killing Arabs to steal their organs, on the strength of unsubstantiated statements made by Israel’s enemies — including those who themselves regularly practice murderous terrorism! But that doesn’t matter, because actual evidence is not required when the hatred is irrational. We find irrational, obsessive and extreme hatred of the Jewish state everywhere on the Left, particularly among Jews. One example is here. My thesis is that extreme Israel-hatred in this context is simply an evolved form of antisemitism. Let me explain. While it’s possible to take analogies too far, the biological metaphor seems spot-on in this case. Like a living species, traditional antisemitism developed throughout European cultures (and spread to others) until 1945, because the environment was favorable to it. In fact, one can see the Holocaust as the logical result of this development, the final flowering of it. But like biological population explosions in which a species’ excessive expansion can change its environment in ways that make it less hospitable to the organism, the horrors of WWII changed the cultural environment in which the antisemitism meme lives. At least among educated Westerners, a resistance to traditional Jew-hatred developed, and the meme was inhibited from reproducing there. There were other reasons. I mentioned the trauma of white racism in America. An analogy was drawn between racism and antisemitism. A great amount of energy was directed towards extirpating all kinds of prejudice in our society. Political correctness developed, which helped suppress racism and antisemitism, but also has had other non-benign effects. Unfortunately, like living creatures, memes have the ability to mutate and mutations that improve their ability to reproduce in a particular cultural environment will be strengthened by natural selection. So rather than dying out, the meme evolved. Jew-hatred became Israel-hatred. Instead of being directed at a group of people because of who or what they are, it was directed at the state that they created for themselves. The taboos against racism and prejudice were circumvented, because the meme could be presented as political opposition to a country rather than hate for a people. Little else changed. The fundamental irrationality of traditional antisemitism, by which Jewish crimes and the evidence for them could simply be made up, remained. The ability of the antisemite to believe anything negative about the Jew no matter how outlandish, remained. The application of antisemitism to every area of human interaction — literature, music, sports, professions, etc., remained (consider academic boycotts, for example). The extreme vitriol that characterizes it, remained. And it appears that the ultimate goal — the destruction of the hated object — remains. One way to see the connection between the Oldest Hatred and today’s attacks on Israel’s legitimacy is to note that what is being denied by Israel-haters today is that the Jewish people are a people, and they have a right of self-determination. Keep this in mind the next time — and I’m sure there will be a next time, probably in the next few months — that there are massive anti-Israel demonstrations against the state of the Jewish people having the chutzpah to defend itself. Not much is new under the sun.